Last week, while playing a game of Medieval Madness, the sound suddenly shut off while gameplay continued. Then the initial "BONG!" sound effect from when you turn on the machine went off and then the sound and music came back on VERY LOUD (the default setting of 4 or 5? I have it set to 1 since it's in my kitchen). The loud sound continued through the rest of the ball, but after tho bonus was tallied and ball two was placed into the shooter lane, the sound reset to its normal levels (??!). On ball two the same thing happened, only this time there was no music when it was really loud, only sound effects. I opened up the backbox and checked out the A/V board (if you can't tell - I don't know anything about this stuff) nothing looked visibly burned, all the fuses were OK, the LED was blinking the way its supposed to (according to the manual) so I'm not sure what's going on. If anyone has any suggestions on what to check or anything to try, I would greatly appreciate it, thanks! For my birthday, my parents bought me an upgraded Williams/Bally Ball Trough Assembly. It was a great present, because at $125 it was hard for me to justify buying it for myself. Thanks Mom and Dad! Here I am holding the new trough up in front of the old one which will be replaced. The problem with the old assembly is that the track where the balls sit develops little divots over time (like, say... 18 years!). This has happened on mine to the point where the balls will get locked into the divots and won't slide down to be ejected up into the shooter lane. You'll start a multiball and... no balls! To fix this you have to uninstall the entire assembly and then take a metal file and grind down the divots. I have had to do this twice now. It's not the end of the world, but it's a pretty involved project. 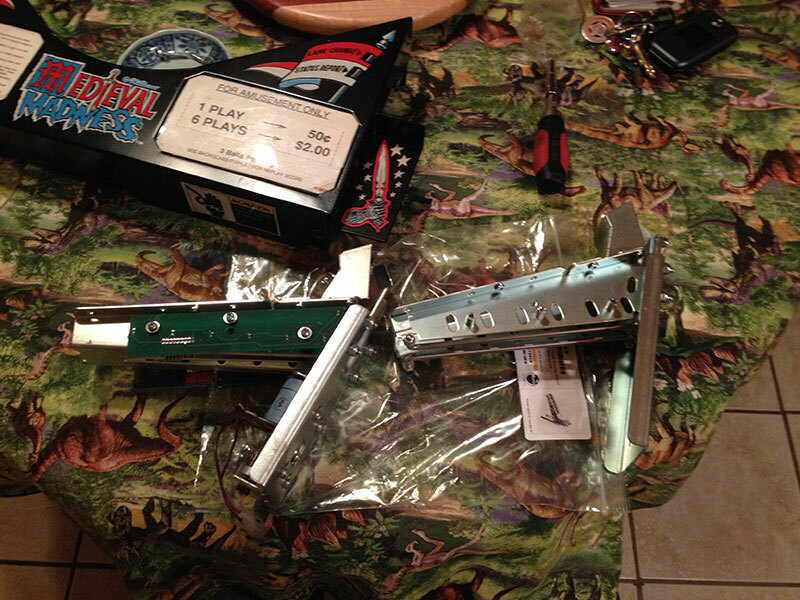 The upgraded assembly uses removable rails as the track for the balls. These can be unscrewed, rotated, flipped and replaced, ensuring that this part will last for the lifetime of the machine! You can access the rails with the playfield up, so I shouldn't ever have to take this thing off the machine ever again. 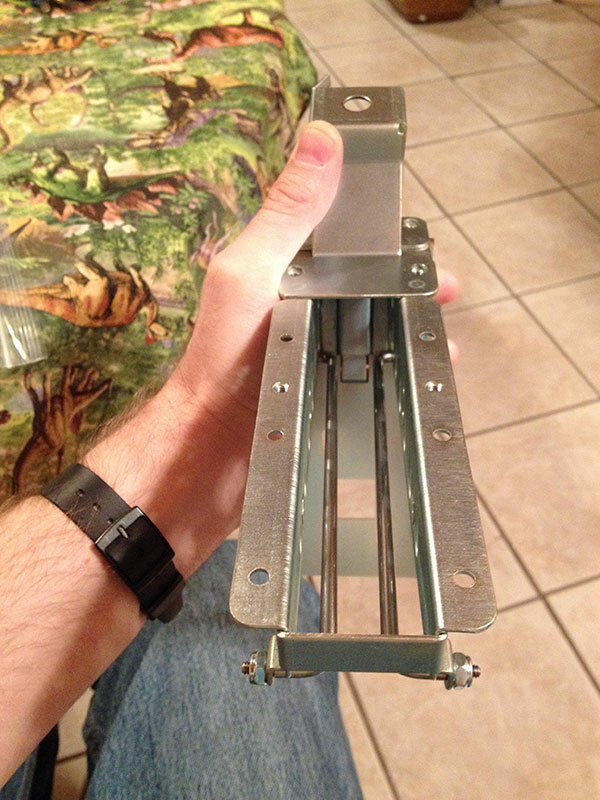 It's also got a latch built into it that prevents the balls from entering the shooter lane, so that you can raise the playfield without having to run the "eject balls" test. I was very excited about this time-saving feature! 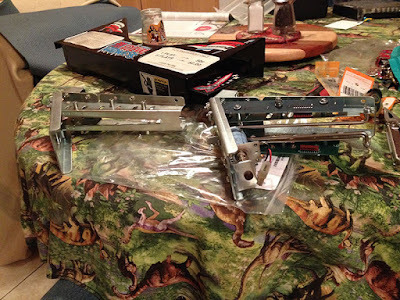 First I took out the old assembly, which you can see here on the left, with its optical boards and solenoid still in place. All I gotta do is transfer those components onto the "blank" new assembly. Should be easy, right? Next I brought this assembly back over to the machine to install it, only to find that the holes in the playfield did not line up with the holes in the top of the assembly! I could only get 4 of the 6 bolts in. I'm sure it's still enough to keep it on there - but come on! It was off by about 1/8" on the last two holes - not even close. 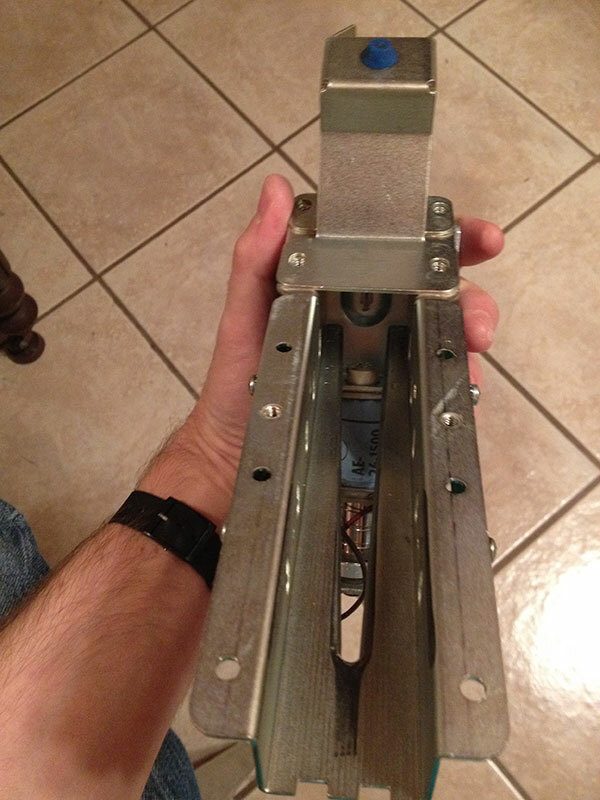 I would think this would be the first thing the designers would make sure is consistent on this redesigned part. Next I thought I'd try out the latch function for the first time. I slid it up and let go. It instantly fell back down. It is very loose (maybe because I had to torque the assembly to try and get 4 of the 6 bolts to fit in the misaligned holes?) Anyway, this was a real disappointment. 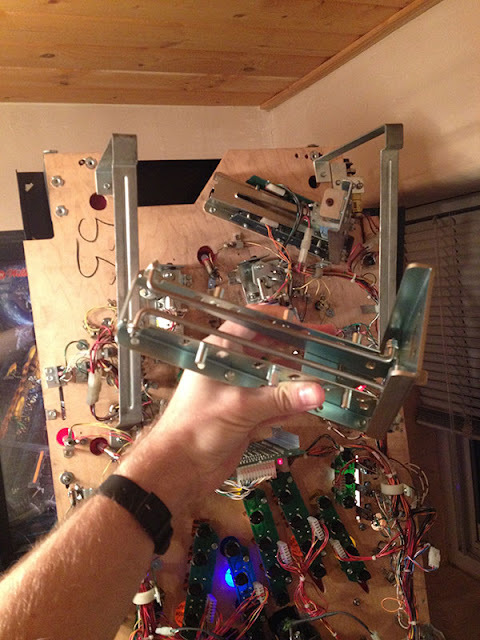 If I keep my hand on it while the playfield is going up, eventually it crosses a point where it will stay down on the other side. I guess I could also tape it before I flip it up? Ugh. 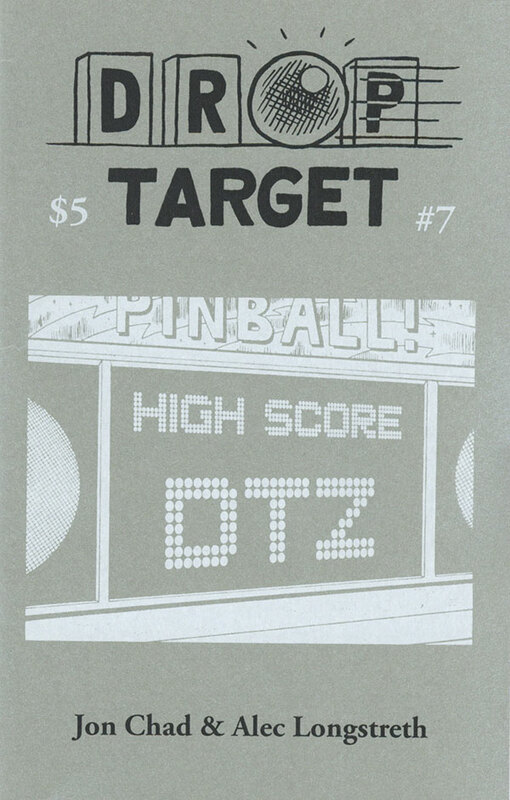 The first printing of DTZ #7 has SOLD OUT! Hello, pinball fans. 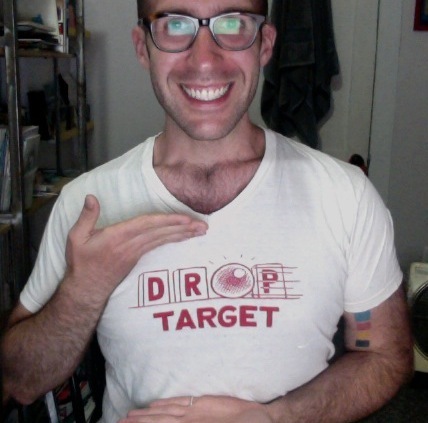 The first printing of Drop Target #7 has sold out! 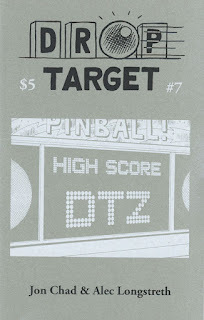 We are now offering copies of the second printing of Drop Target #7 for sale on the DTZ #7 page. These have a dollar knocked off the cover price, but they are also printed with a plain white cover and have a standard 8.5" x 11" grayscale center spread, instead of the cool 8.5" x 14" full color center spread and the screen printed metallic cover stock of the first edition. If you missed out on the first edition but would like to track down a copy, our friends at Radiator Comics still have copies available - get them before they're all gone! The Weezer Pinball T-Shirt that I designed has now been turned into a video game that you can play on the internet! 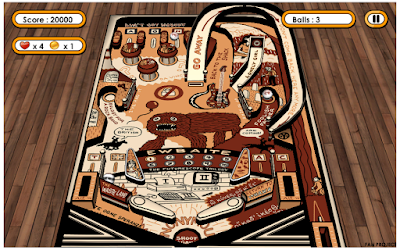 You can get all the information on how to set it up and play over on my illustration blog! Some of you might not know this about me, but before I started working at the Center for Cartoon Studies and drawing comics, I worked as a shirt printer. Since I left the shop, I've dabbled with it a couple times, but I've always wanted to do a real run of shirts, even if they were simple. I made 2 DTZ shirts a couple years ago; one for me, and one for Alec. In preparation for ReplayFX (7/30 - 8/2 in Pittsburgh, PA. You're going, right? ), I wanted to do a run of DTZ shirts. The design is simple but I really like the red-on-white look. a) you really should think of coming! b) after the show, I'll sell the remaining shirts via email. 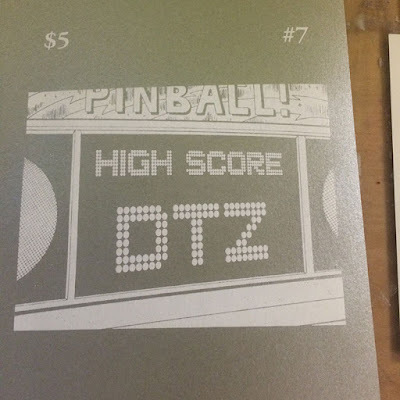 Show your DTZ and pinball love! As ReplayFX gets closer (7/30-8/2, you're going, right? ), I want to post some more teasers of what I'll be bringing in addition to the final issue of Drop Target. 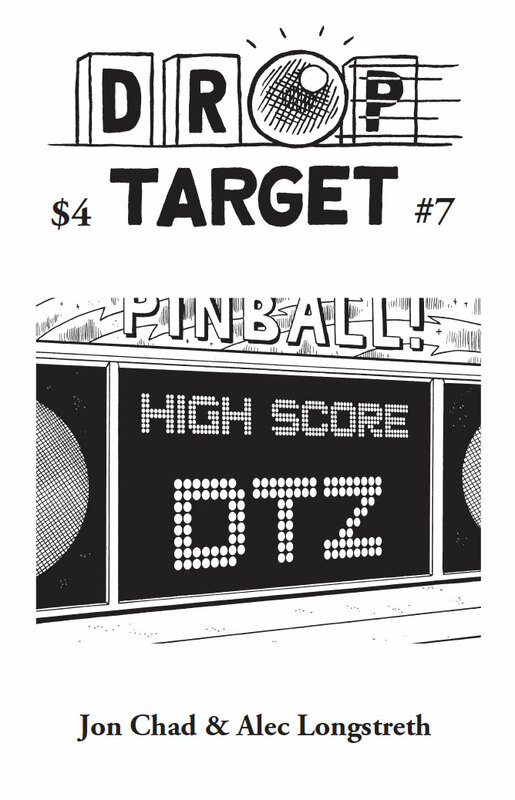 I'm happy to say that I'll have ten copies of the PHENOMENAL Australian pinball zine, Slam Tilt, at the table! The combo of art, articles, and attitude make this a zine that shouldn't be missed! You might remember that I did a write up of Slam Tilt when it first crossed my path. There's only ten copies, though, so make sure that you get to the table early!! More cool stuff to come! 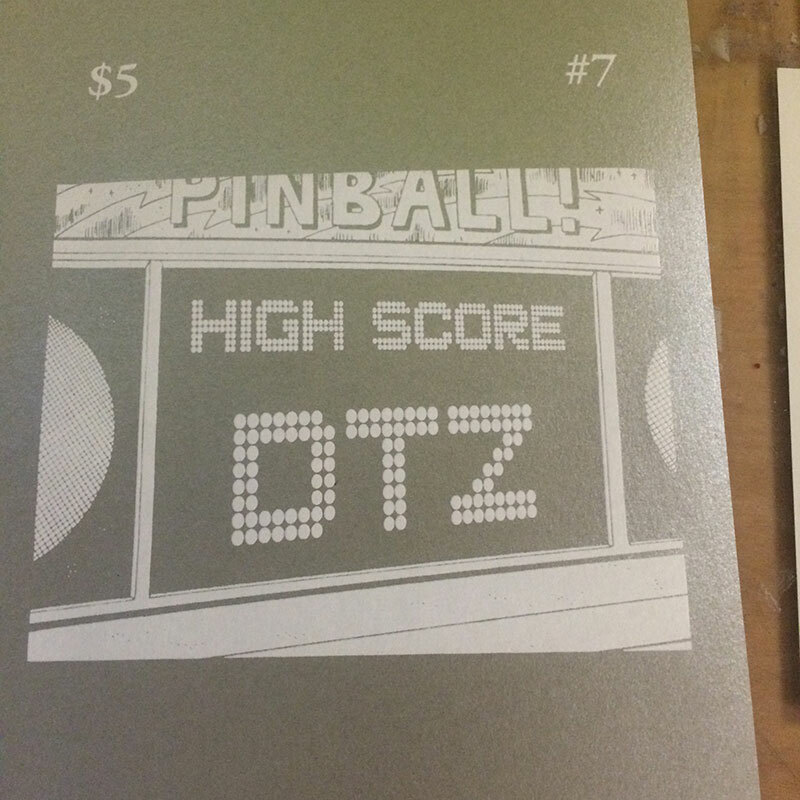 Tabling DTZ 7 and pinball art at REPLAY FX!! As I'm getting ready for vacation, I realize that I haven't mentioned yet that I'll be tabling at Replay FX from July 30 - August 2 in Pittsburgh, PA. 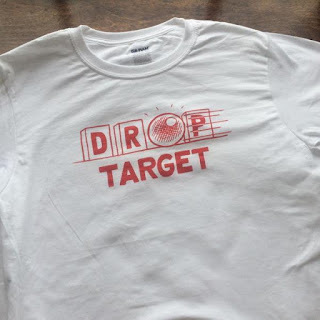 I'll be tabling with the NEW and FINAL issue of Drop Target Zine, issues 1-6 of DTZ, and DTZ Shirts. Get hyped for DTZ #7! It's a beast of an issue! 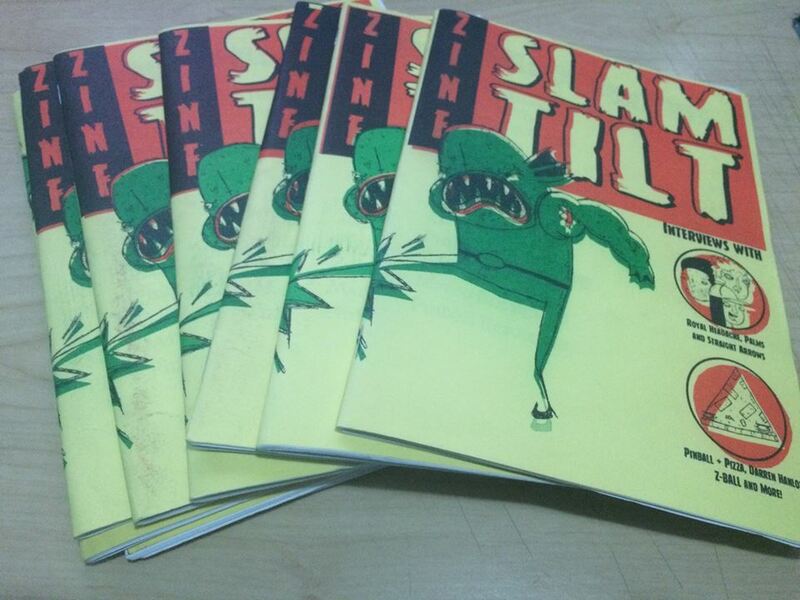 Additionally, I'll have the first issue of Slam Tilt, a pinball zine from Australia. Jeremy Wilson has put together a great zine, and I want to get into hands here stateside! 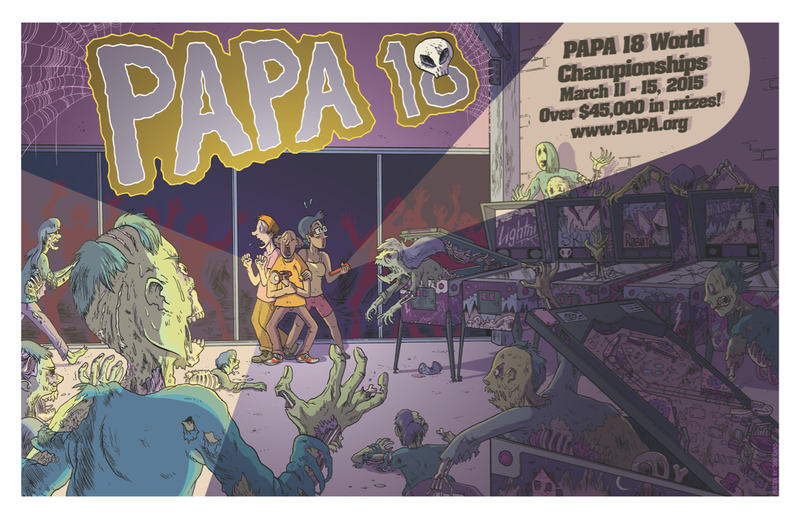 Finally, I'm going to be selling original art from my last 4 years of doing posters, shirts, and tokens for PAPA, Stern Pinball​, Skill Shot, DTZ art, and a lot more. The sun is setting on DTZ, so this might be the only pinball show I table at! Help spread the word! Jon and I spent the last two weeks in Vermont, teaching summer workshops at The Center for Cartoon Studies. After each long day of teaching we would drag ourselves up to the studio to spend the rest of the night putting Drop Target #7 together. Our initial goal was to try and finish the zine during those two weeks, but unfortunately we were not able to get it done... There were just not enough hours in each day! All that being said, we're very close to being done! Jon is heading off to Europe for a few weeks and by the time he gets back I will have all of my assets done and then we'll be able to finalize the layout. Our plan is to debut the zine at Replay FX at the end of July, which Jon will be tabling at, and then it will be available here on our website in early August. Thank you, dear readers, for your patience and we hope that this final issue will be worth the wait. Okay, I better get back to it! DTZ orders delayed until June 3rd! Hi everyone, just a quick head's up to let you know that I am heading to England for two weeks on my honeymoon. Any DTZ orders that come in while I am gone will be sent out upon my return, on June 3rd. Sorry for the delay and thanks in advance for your patience! I mean in the show...not the actual West Wing. If I could get confirmation that in the very deepest inner sanctum of government, there was a pinball machine, I would be ecstatic. No, however, I am talking about the Martin Sheen classic, West Wing, The show ran seven seasons from 1999-2007. I'm on season 3, presently, and earlier in the season, the cast of main characters is in a bar somewhere, presumably in New Hampshire. 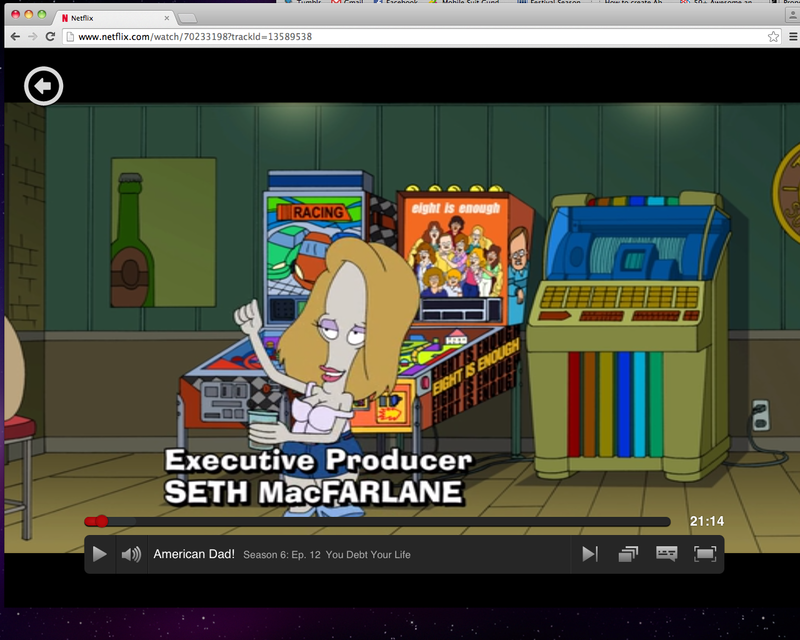 The camera pans across the bar and there is a man playing a pinball machine. Or... 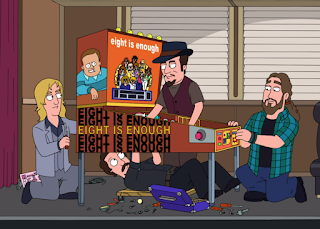 I should say that the man appears to be playing the machine. I've gone over this clip again and again, and I don't think he is actually playing. Can anyone out there in internet tell me what is going on on the DMD? Is this actual gameplay? The game in question appears to be Junkyard. I would not be surprised if this poor extra was just asked to pretend that he's playing pinball, but there's a part of me that also wants Aaron Sorkin to be, like, "keep playing! I want you to be getting jackpots when the camera's on ya!" 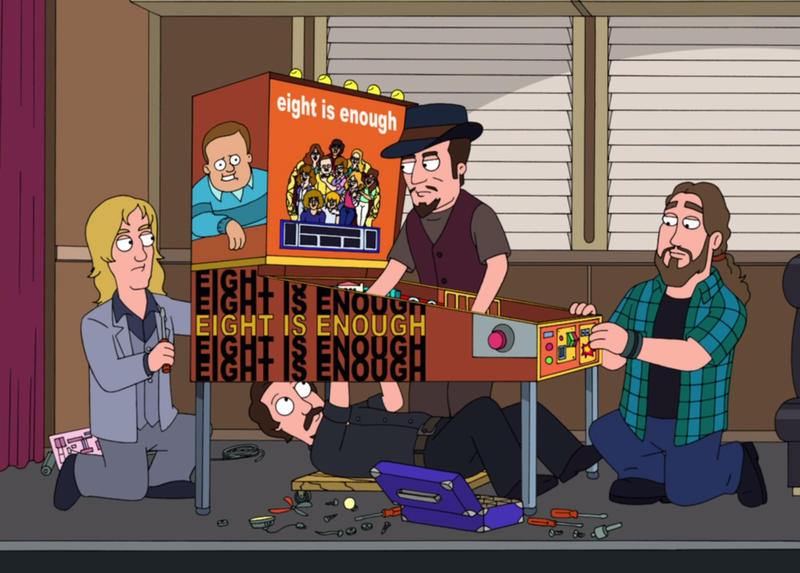 It's a no-brainer that now that I'm cued into pinball, I always keep my eyes open for whenever a machine pops up in a TV show. Recently, I've been obsessed with Gilmore Girls. 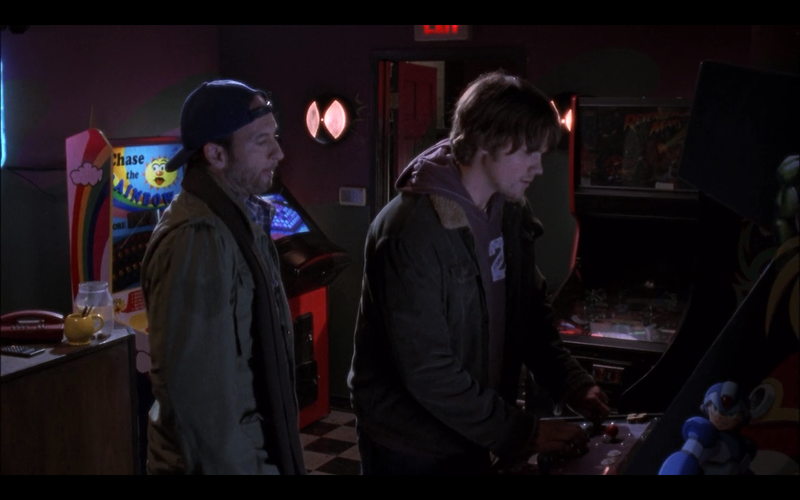 I had thought that I knew every square inch of the tiny CT town, Star's Hallow, but at some point in season...5?...there was a scene that took place in an arcade! Let's see what they've got! Alright! Pinball! A Night Rider machine. For the life of me, I can't figure out what the machine just to the right of it is. The character pictured (Luke) keeps on passing in front of the camera at the PERFECT point to obscure my view. Cool! A Revenge from Mars machine! Hmmmm, it doesn't seem to be working, though. Someone should call the operator. Between those three pins, "Chase the Rainbow" (!?!?! ), a Galaga machine, and a couple other assorted video game cabinets, Star's Hallow has a pretty good arcade going! 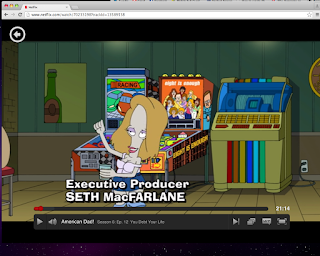 My biggest question is with the machine that the character is playing in the image to the left. The art on the side is, without a doubt, from the Megaman X series (a video game series that was for the Super Nintendo). I'm really curious as to what that cabinet is from. I've been doing some research, and I can't find any evidence that there has been a cabinet version of any of the Megaman X games. Maybe it's a cabinet just running an emulator? 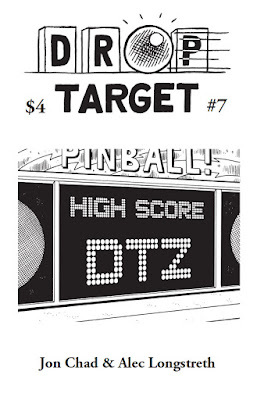 Very excited to start working on DTZ#7. At the beginning, Alec and I share a blank folder and start filling it up. I always have the thought, "oh, this should be easy! Every issue gets easier than the last, right?' Spoiler, the answer is no. This issue is going to be a blast! We have a lot of rad stuff planned! I stumbled on this site a while ago, and I realized that not everyone might be clued into its greatness. 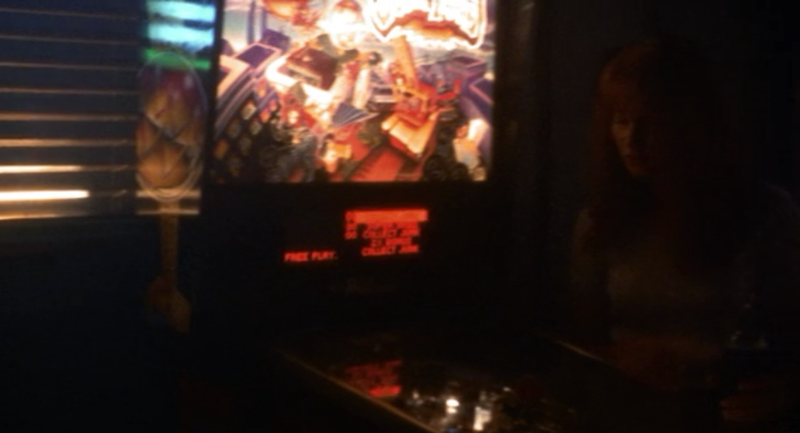 This is Pinball in the Movies, a subsection of the Pingeek.com site. Here, there is a list, gathered from 2001 of the appearances that pinball makes in various movies. The attention to detail is awesome. 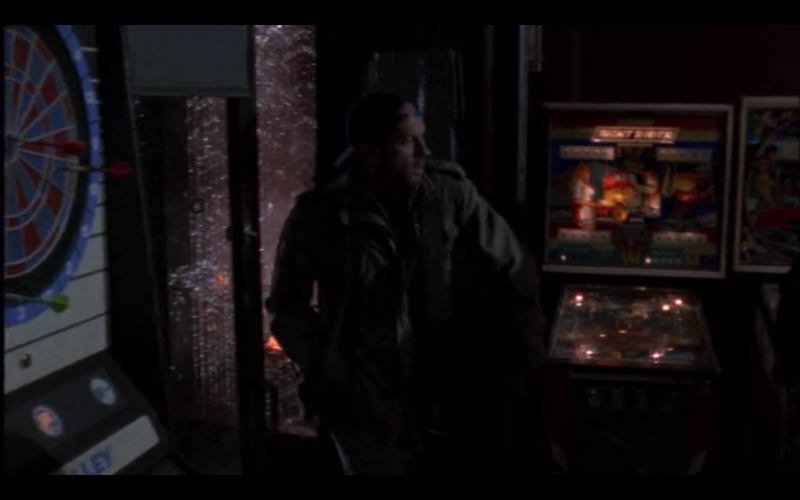 There are some movies like Jurassic Park 3, where a pinball machine is only featured in a bar, SUPER briefly. It's listed on the site! It's really fun to check out! As this is posting, I should be in Pittsburgh, PA for PAPA 18, and then visiting in the days following with some of my favorite people in the world (Sophie, Carl, Josh, and Joyana!!!). 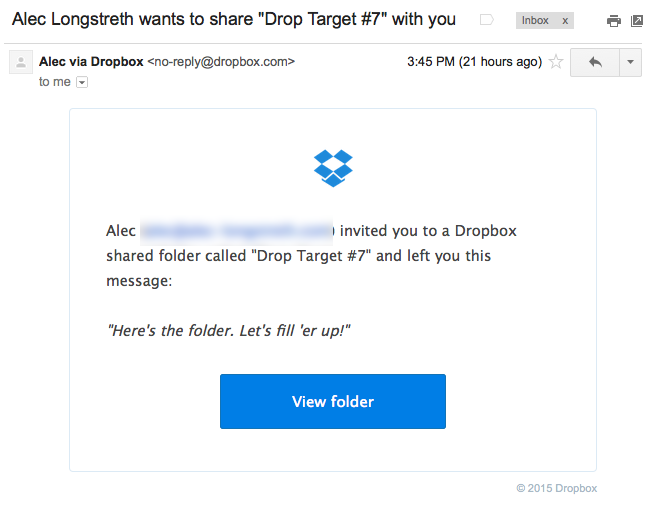 I queued this up so that we can have uninterrupted service here at Drop Target HQ. I was in the car with my girlfriend the other day when she asked me, "have you played every pinball machine?" Of course the answer is a resounding NO, but then she asked, "how many of the, like, top 100 games have you played?" Hmmm, a more reasonable request. I went onto IPDB and pulled up the list of top 300 SS machines and started from the top, checking which ones I had played, and which ones I hadn't. Here's the machines I haven't gotten a chance to play YET! Now, I want to STRESS that this does not mean that I am a knowledgeable expert, or even competent player at the games that are NOT on this list. I'm still at the point in my pinball journey that I am discovering what is out there. 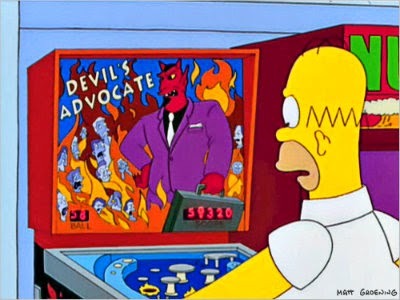 That being said, the past couple of times I've gone to Pinball Wizard Arcade in NH, I've spent more time on one or two machines, instead of trying out every machine separately. It's the token bag that I used to use for Aladdin's Castle! AHHHHHH!!! I was inseparable from this thing as a kid! I put ZBots in it, Keshi, Tokens, Quarters, you name it! I'm so happy to have it back in my life again! I can't wait to take it to PAPA 18 THIS WEEKEND!!! In a side note, I've tried to save a token from every arcade I've been to, but I CANNOT find my Aladdin's Castle token! This is a total travesty in the Jon Chad universe. If anyone has any leads before I take the search to eBay, let me know!! One of the things that I used to love about working at a screen-printing shop, is that you never knew what you were going to be printing on. You could be doing shirts one day, hockey pucks the next. It was a great feeling to create so many different objects that human beings use in such wildly different ways. These day, mostly, I work on books, and objects that are printed on paper, in one form or another. One exception is the (almost sculptural) minicomic work I've done for BOOM! Studios, and the tokens that I've done for PAPA and BAPA (the Bay Area Pinball Association). I really enjoyed working on this design, and although I get nervous when something I do, mistakes and all, are literally CAST IN METAL, I think it came out great! There is something REALLY cool about designing tokens! It makes me feel a connection to the old arcades of old and makes me think of the places I used to haunt, and the machines I used to play. See the tokens put a smile on my face! If you are planning to go to PAPA 18, get ready for a Jon Chad high five!! !